Other Products: Creme cardstock, Lilac cardstock, Cutting machine (Big Shot), Scissor, Ribbon, Pearl pen Creme, distress tool, Distress Ink Vintage photo, Fine liner, Rope. Instructions: Cut a piece of Creme Cardstock at 10 x 5 inches and score on the short side 1/2 inch, now cut a piece of creme cardstock at 9 1/2 x 5 inches and glue this one on the flap, then you have your double card. On the open side make a mark in the middle at 2.5 inches in then cut out that V shape. Distress all the edges with the Distress tool and Ink them with the Vintage Photo. Cut from Lilac cardstock a piece of 9 x 4 1/2 and cut a V shape out, then a piece from the paper collection and cut this at 8 x 4 and cut out a V shape. Ink this one too with Vintage Photo, glue all the pieces on top of the card and put small lines with the Fine liner on the top one to make it look like stitches. Now stamp with Black Tuxedo Ink the Lush Lilac stamp set and the rain Boots and Blossoms stamp set, color all the flowers with the Sweet Plum, Lulu Lavender and the leaves with bamboo Leaves, cut them all out with the coordinating dies, and shape them with the Deluxe shaping set. Make holes in all the small lilac flowers, cut the stamens in half and put a stamen in all of the flowers. 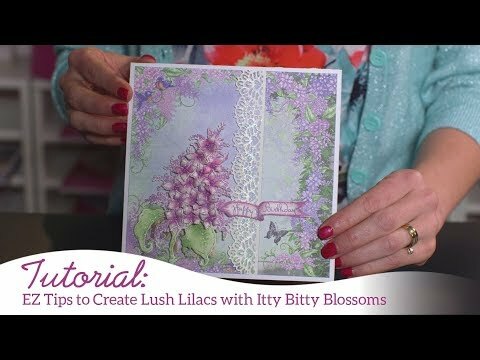 Stamp on Lilac cardstock some carnations and cut them out with the coordinating dies, wet them and shape them on your Deluxe shaping tool set. Put some dots on some flower ends with the pearl pen. Cut out a flag with the young at heart die and write the words "a new home" on it. For the inside you cut a piece of creme cardstock at 2 inches, the width of the card and glue them on 2 sides in the card as a pocket, then cut a nice border with the ornate borders and pockets die and glue this one on the pocket on 3 sides, then you have 2 pockets. Cover it with a piece of paper from the collection and ink the sides. Now cut a piece of Creme cardstock of 5 x 3 and cut 2 edges and round 2 corners, make a hole in the top and pull a ribbon through it and wrap a piece of rope around that, Ink the edges.